Posted on June 27, 2011 10:16 AM by Lana N.
Gov. Scott Walker already had to change the venue for his signing ceremony once because he had previously scheduled it at a tax cheat's business. With the venue once again set, hundreds of Wisconsinites awaited Gov. Walker at the signing ceremony for his extreme budget bill on Sunday to voice their opposition.Normally a governor's signing ceremony is a quiet affair, with a few local dignitaries and a small gaggle of reporters to record the moment for posterity. Instead, participants in the signing ceremony faced cries of "SHAME! SHAME!" as they entered from hundreds of protestors lining the street and corners outside the signing ceremony location.Because of his reactionary leadership thus far in Wisconsin, Gov. Walker and several supporters in the Wisconsin state legislature who helped him pass the controversial budget face a likely recall in the coming year. Posted on June 26, 2011 6:55 PM by Lana N.
Posted on June 25, 2011 4:16 PM by Lana N.
In case you missed Thursday's Rebuild the Dream launch spectacular, or if you watched it live and couldn't get enough, we now have video highlights! As a special bonus, we also have a shout-out from AFL-CIO President Richard Trumka. And of course, we have the full livestream of Van Jones' presentation and special performances by The Roots.For highlights, follow the link to http://www.rebuildthedream.com/highlights. Don't forget to share it with friends! Success in New York City! Posted on June 25, 2011 5:18 AM by Lana N.
Overshadowed (with some justification) by other momentous news from New York last night, we have some good news from Manhattan. After a lengthy negotiation process, which included constant pressure from protestors, Mayor Michael Bloomberg's office reached a deal with unions and opponents on the City Council to avert most of the promised cuts and layoffs. Teacher layoffs were avoided altogether, and no fire companies were closed. Services for elderly avoided almost all cuts, and HIV/AIDS housing funds were restored.The deal is tentative, however, and not all jobs were preserved. 2,600 teacher positions open due to attrition will be left unfilled. And the City Council still has to vote on the deal before Thursday before it can actually go into effect.Still, without constant public pressure and the courage and commitment of thousands of New Yorkers who rallied against the proposed Bloomberg cuts, thousands of jobs and hundreds of millions of dollars of essential services for the most vulnerable New Yorkers would have been long gone. The victory is also a fitting coda for Walkerville, which perhaps didn't have the same immediate success in stopping WI Gov. Scott Walker's extreme budget, but ultimately inspired New Yorkers in their own successful effort. Posted on June 24, 2011 5:45 PM by Lana N.
Posted on June 24, 2011 3:01 PM by Lana N.
This year has been full of protests against conservative governors and right-leaning big city mayors who have used the economic crisis as cover to attack worker rights and slash essential services. The austerity agenda and the resulting response from the people started in Wisconsin and spread to Michigan, Indiana, Ohio, Florida, and even New York City.Now it's San Jose's turn. The mayor of the self-proclaimed capital of Silicon Valley, Chuck Reed, has threatened to declare a fiscal state of emergency and put a pension cutting measure on the November ballot, threatening the promised pensions of thousands of city workers. Nevermind that California's Attorney General has stated that such a declaration of emergency is legally dubious.In this climate, a a large gathering of young activists camped out last night in front of City Hall to get a front row seat for today's City Council hearings on the pension cuts. Before they bedded down for the night, the activists from Next Generation Bay Area donned their zombie makeup and marched down Main Street dancing to Michael Jackson's "Thriller." "We're dressed up as zombies because we want to represent that if the mayor and city council weaken collective bargaining in San Jose, we'll be the working dead," said Jamie Chen, a marcher. "There will be no future for young people here." 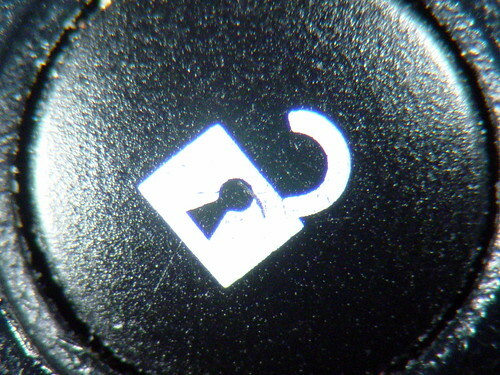 Posted on June 23, 2011 2:02 PM by Lana N.
[caption id="" align="alignleft" width="300" caption="Unlock image courtesy of Flickr user jwinfred, under a Creative Commons license"] [/caption]Earlier this week, we told you about a California woman, Tanya Dennis, who fought Wells Fargo to keep her home, even getting a locksmith to let her back in to her own house. Due to the pressure of over 1500 e-mails to Wells Fargo executives and an ACCE delegation visit to Wells Fargo headquarters in San Francisco, Wells Fargo has agreed to halt the eviction and to meet with Dennis about a fair modification.It cannot be called a victory for Dennis until she meets with Wells Fargo and has a firm agreement, but it is certainly encouraging to see that people can come together, organize, and win back rights for at least one homeowner. Kudos to ACCE and the Home Defenders League for leading the fight for Tanya Dennis. 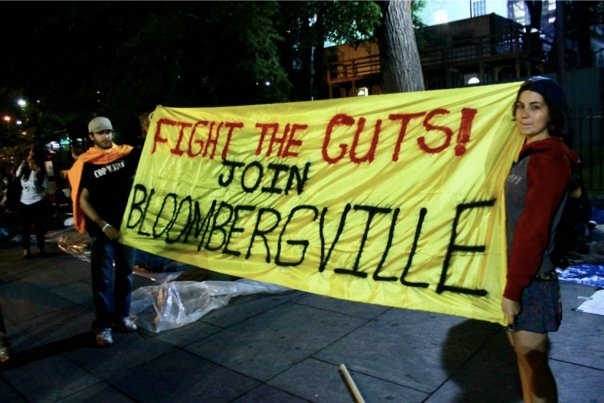 Posted on June 23, 2011 10:17 AM by Lana N.
For the past ten days, New Yorkers have camped out at City Hall in Manhattan at "Bloombergville" to protest Mayor Michael Bloomberg's austerity measures when other options are available. They've even drafted a Bloombergville Declaration, a clear statement of why they are protesting and what the real solutions to NYC's budget problems might be. Posted on June 22, 2011 1:30 PM by Lana N.
Jobs at living wages, reinvesting in America. Equal access to quality, public education. A secure retirement, with the ability to retire in dignity. Good housing and protection from hunger. A safe, clean, and healthy environment. A just taxation system where corporations and the wealthy pay their fair share. Posted on June 21, 2011 12:46 PM by Lana N.
As we mentioned last week, janitors planned to lead rallies around the country to mark the anniversary of a 1990 Century City march stopped short by police brutality. The workers didn't just aim to commemorate those injured in the march, or even the organizing victory that followed soon after. They also hoped to raise awareness of sliding standards of living for people who work incredibly hard for a living with little recognition or compensation.In Los Angeles, 1,000 janitors and supporters gathered along the streets next to the Los Angeles County Art Museum, looping all the way around the block until ending with a rally in the museum park.In New York, hundreds gathered along Fifth Avenue in the shadow of the skyscrapers they help to keep clean. In Connencticut, workers rallied in front of the Government Center. 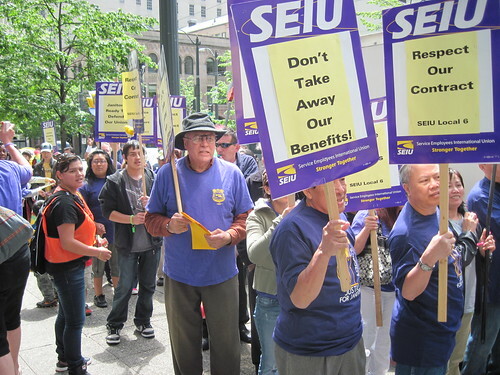 In New Jersey, janitors walked off the job to protest low wages and poor working conditions. All told, janitors and their supporters rallied in 15 cities across the country.Many of the workers pointed out the desperate need for immigration reform due to the development of an underground economy that exploits undocumented workers and pushes down wages and working conditions for everyone. Sadly, janitors clean up at companies who are making record profits, while the janitors themselves make in some instances as low as $312 a week after taxes working a full time job... after years of experience.Organizers stressed the need to stick together to fight back against corporate greed, anti-labor policies emanating from state capitals around the country, and a disturbing trend towards unregulated temp agencies that skirt minimum wage and fair labor laws.